Because That's Where the Best Light Was. That's why they are on top of the bed. The table is solid wood and folds, it was $1. I kind of like the orange color. The huge wood tray looks like mahogany. It was some white paint speckles on it, and a couple chips, but for fifty cents I can deal with those. So cool! I love them. You always find the best treasures! Woohoo! 50 cents is always exciting! I like the little table. 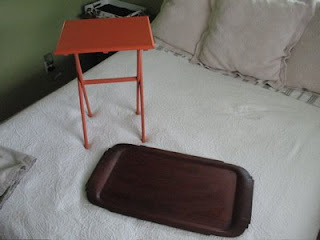 neat-o finds, i love the orange tray table! i need something like that for my porch so we can play games after the boy goes to bed.